A proposal to mine coal near Black Diamond, and possibly burn it at Ash Grove Cement in Seattle, has advanced under the Trump administration. King County Executive Dow Constantine has vowed to stop the project. 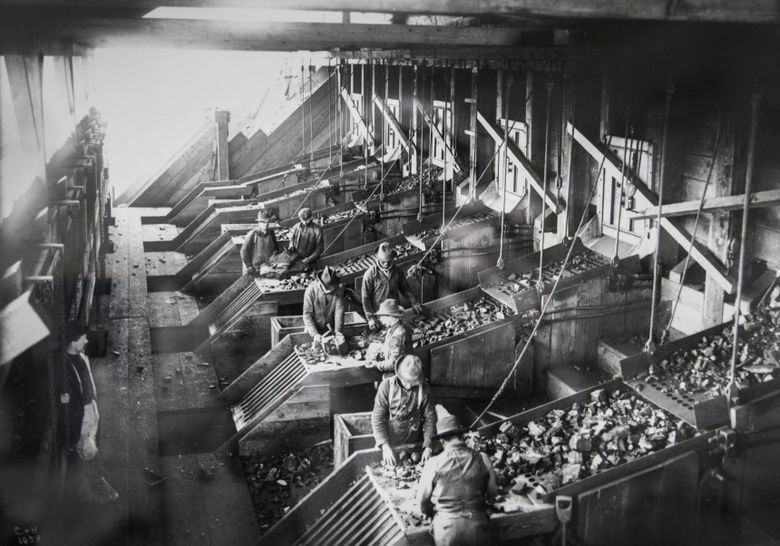 An old King County coal mine would get new life under a plan by a Black Diamond company that got a recent boost from the Trump administration. 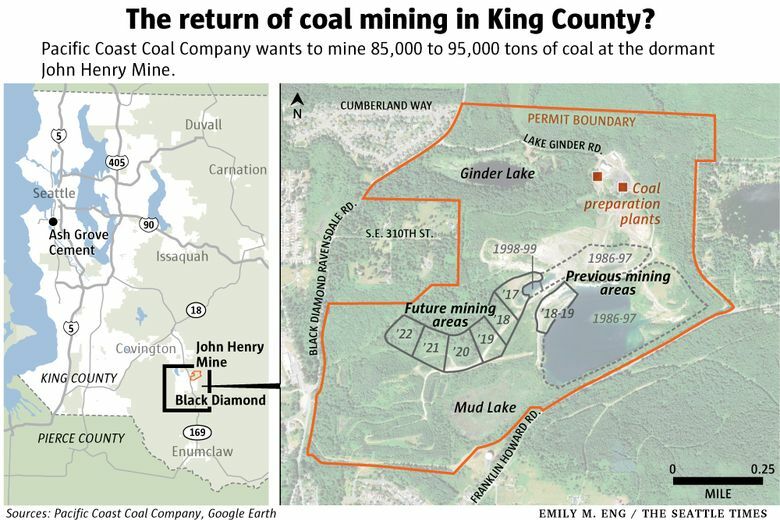 Pacific Coast Coal Company seeks to mine 85,000 to 90,000 tons of coal per year over six years from about 30 acres just outside Black Diamond, kicking the mine back into operation for the first time since 1999. 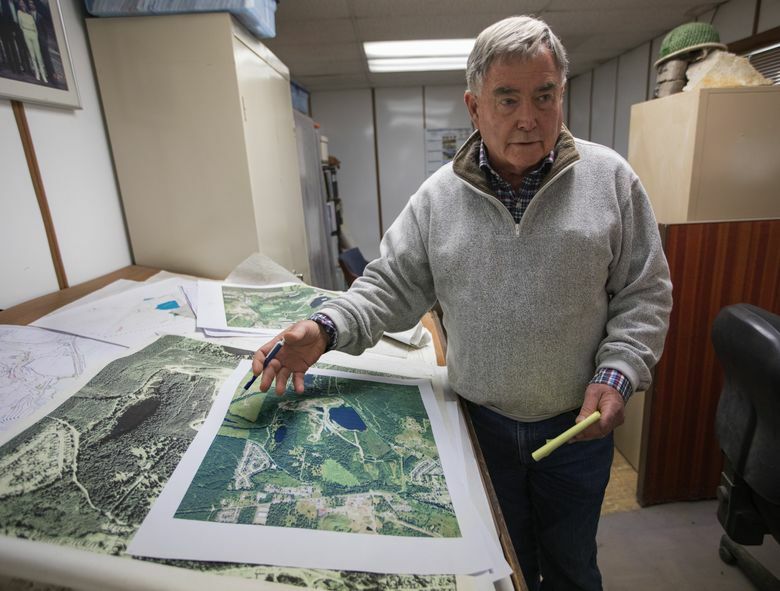 Mining first began on the 480-acre parcel of privately owned land in 1986. The company wants to start up mining again on the property, at the John Henry Mine. The proposal is still under review — though the feds in September found that coal mining as proposed at the John Henry would have no significant impact on the environment. The feds are reviewing public comments; the next step could range from additional environmental review to granting the permit. Washington is one of only two states in the country that delegates regulation of mining to the federal government (Tenn­essee is the other). But the project nonetheless has raised local ire about the greenhouse-gas emissions created by burning the coal, as well as water pollution and noise. King County Executive Dow Constantine has vowed to work with state agencies and Washington’s congressional delegation, as well as the courts if need be, to stop the project. Burning coal from the mine would emit as much carbon dioxide into the atmosphere each year as driving 51,500 cars, according to the U.S. Environmental Protection Agency. Coal is the dirtiest and most polluting fossil-fuel energy source, with as much as twice the greenhouse-gas emissions per unit of energy produced as any other fossil fuel — contributing to global warming, the King County Department of Permitting and Environmental Review noted in a letter opposing the project. “The Earth is rapidly moving toward global climate catastrophe and the notion that we would have a company here digging up rocks and burning them, rocks that should be left underground, is not consistent with the values of the people of our county,” Constantine said. Yet the coal could wind up being burned right under his nose: One of Pacific Coast’s possible customers for the coal is Ash Grove Cement, next to the West Seattle Bridge. While the company is presently using natural gas to fire its kiln for making cement, coal is no stranger at the facility, which as recently as 2016 was burning coal by the thousands of tons. With the need to generate heat of more than 2,500 degrees Fahrenheit to make Portland cement, the company uses a range of whatever is most cost-effective to stoke its manufacturing process: petroleum coke, coal, natural gas, whole tires, waste lubricating oil. Ash Grove burned 9,712 tons of coal in 2016; 51,278 tons in 2015; 32,308 tons in 2014 — and 90,633 tons in 2007, state records show. “We would just be replacing what they are already doing,” said David Morris, general manager of Pacific Coast Coal Company. The third generation of his family to mine coal on two continents, he’s watched the family mining business in King County transition over the years to selling sand, gravel, topsoil and beauty bark. But there still are rich seams of coal underground here it makes sense to mine, as the company proceeds with its reclamation work at the site, Morris said. The only coal mine left in the state, one of the mines here at 2,000 vertical feet was once the deepest in the country, employing hundreds of miners. 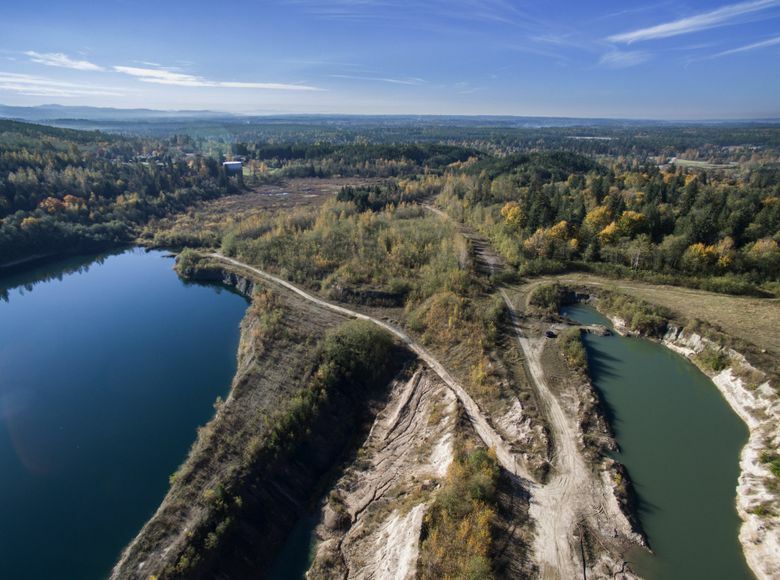 The property already is extensively disturbed from prior mining, and reopening a portion of the landscape to mining is one way to do some of the reclamation work that already is required there, Morris noted. That includes knocking down piles of scraped-off dirt at the site there for so long they have grown over to trees, and re-sculpting the sheer sides of the former open pit to a gentler grade. The pit is now full of water, and on a recent fall morning, ducks floated on it. Morris pounded over the rutted ground in his Lexus SUV with walnut trim, showing the areas that under the proposal would be dug up, blasted, crushed and shipped from a site now ringed by suburban development — with more than 6,000 more homes possibly on the way. County and state officials say it is exactly the changes in the neighborhood, as well as in county and state laws since the mine’s underlying permits and environmental review were conducted 30 years ago, that make the fed’s review of the project so far wholly inadequate. From changes in stormwater regulation and engineering practices to limits on greenhouse-gas emissions, there is no way the project measures up to current standards, let alone deserves a finding of no significant impact, the state Department of Ecology and King County have written in comments to the feds. Both the county and state have demanded more comprehensive analysis of the projects and its impacts. Chris Holmes, public-affairs officer with the Office of Surface Mining Reclamation and Enforcement in Washington, D.C., said those and other comments are presently under review. “The Finding … that was provided in public documentation is unsigned and not final, pending the analysis of public comments,” he wrote in an email to The Seattle Times.